I'll try to keep a journal for the season here this year. If it goes well, this will become a regular thing. Who knows, if nothing else, it's something to look back at when the freezer is empty, the rains of winter fall, and cabin fever sets in hard. I drew B-zone and G-1 tags for this season. This means I'll be able to hunt from 9/15 through 11/4. Mim and I headed out late on Friday night, arriving at the trailhead to Kokopelli Valley around 00:30. Kat was going to join us, and bailed out at the last minute, so it's just the two of us. This will be Mim's first season deer hunting. I'm not sure how she's going to take to the amount of hiking, but I'm really happy to spend the time with her. 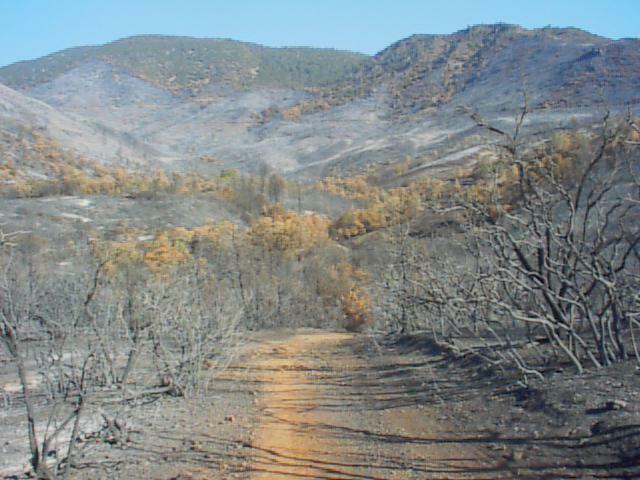 The Trough Fire which had burned so much territory up here ran right through the canyon. In the darkness I barely recognized the trailhead. Passed it the first time, then realized what I'd done and turned back. Nothing looks the same. The image below shows the trailhead as it looks right now. Normally, this trail (an old ranch road) is a virtual tunnel through the chemise, scrub oak, and manzanita. Opening morning. The alarm goes off at 05:15, but I hit the snooze. I doubt we'll have much company here after the fire, and arriving so late last night I need an extra fifteen or twenty minutes. When I finally rise, I see the haze of daylight already creeping over the hills! I roust Mim, and after some morning ablutions and convolutions (nothing goes right when you oversleep on opening morning, does it? ), we are on the trail. We hike in, under the gaze of a trio of road hunters high above. We cruise all the way to the end of the box canyon, then turn and explore our way back. I'm looking for fresh sign, new growth, anything to suggest that the deer are still here. The old orchard is still standing, but the fire has claimed the apples. The fig trees and blackberries are also gone. A little bit of new green is popping up around the seeps on the hillside, and deeper down in the canyon there are some green oaks where the creek is wider and deeper. I won't get down there with Mim in tow, though. She's a trooper, and we've covered a lot of ground this morning, but it's getting hot and she's starting to wind down. We head back to camp around 09:30. Sitting in camp, I can see most of the canyon from here. The cover is almost all gone. The road hunters roll by, and I recognize them from last season. They're regulars here, and recognize me as well. They stop, and we chat for a while about the morning. They saw a doe when Mim and I first went in. Said we walked right by, and she didn't even look up. I have a brief inward pride, for Mim's ability to walk quietly with me. As we stand chatting, one of the other guys is glassing the far side of the canyon. There's a deer bedded under a pine. I try, but can't spot it right away. He says it's a doe, and we chat a while longer before they drive off. An hour later, I see the deer get up under the tree and move around. I put the 22 power binocs on it and see spike antlers, about the length of his ears. He pokes around for a moment, then cuts up the canyon wall and over the ridge. The top half of the canyon has burned completely clean, and the deer is plainly visible all the way up and over. 1130, and Mim is getting bored. The sun is high, and camp is really heating up. This spot is usually hot, but now that there is no vegetation there is no shade whatsoever and it's blazing. I decide to take Mim for a drive, and do a little road hunting/scouting. We cross over to Black Diamond trail, and I scout a couple of places I've hunted before. The creek looks interesting, but I don't think Mim can navigate that terrain. Further up the road, I get out and do a couple of quick excursions from the truck, and make plans for later in the season. I can see that I'm not getting much more out of my little partner today, and want to save her energy for the evening hunt. 14:30 we're back at the trailhead. The blow flies seem to be pretty thick now. Wonder where they all came from? We set up near a seep on the hillside. Tender green grass is sprouting all over it, standing out clearly from all the burnt brown and black. I realize that this spot is clearly visible from the road, but hope that news of the fire will keep road hunters to a minimum. I'm also hoping that since it is opening day, the deer haven't gotten wise to hunting pressure yet and will venture out into the open to feed. I select a spot to sit, and Mim promptly goes to sleep. 18:30, I see a single deer moving across the "long meadow". This is a spot where I have always seen deer in the past, and as I look through the glasses I see that this area apparently survived the fire intact. There is a good growth of ground cover, and the oaks look to be mostly green. The deer, a doe, picks at some acorns and slowly moves towards us. At some point, she turns and goes another direction, though. I decide to head out well before dark, in order to make it easier for Mim to walk the rocky trail. Sunset is at 1920, and we pick up and head out of the canyon then. The sun is disappearing under the far rim of hills as we walk together up the trail. I put a Jimmy Buffett CD in the truck player, and we have a dinner of filet mignon and steamed vegetables, and watch the stars in an amazingly clear sky to the sounds of Beach House on the Moon. We're both beat, and turn in around 21:30. What a day! 05:15- I guess I wore Mim out yesterday. She doesn't want to get up and hike today, so I decide to hunt beside camp. I let her sleep in, and slip out into the morning. The fire has cleared all the underbrush, so I can hunt with pretty good visibility right down near the truck... close enough to hear when Mim wakes up. Nothing happens in the early hours. Finally, around 08:30, I see movement across the canyon. A deer is crossing open ground, in the same spot where the little spike was yesterday. I put the glasses on her, and then see two, then four, and eventually five deer moving in a line up the canyon. There is not an antler among them, and I watch the little group follow almost exactly in the tracks of yesterday's deer over the ridge top. I'll have to get over there and see where they're going. Again, normally that ridge is impassible with chemise, poison oak, manzanita, and all the other chapparal flora. But since the fire, it'll be a reasonably easy hike. I'll take it next weekend. 09:30, Mim's not stirring, but I'm getting restless. I wake her, fix coffee and Pop-Tarts (orange juice for Mim), and we enjoy a breakfast before the heat of the day comes on too strong. I break camp after breakfast, and we hit the road. We'll take the long way around, giving me a chance to survey the fire damage and look for more likely hunting spots. Looks like Kokopelli Valley is going to need a rest this season.